One of my favorite TV detectives, Vera Stanhope, returns to U.S. shores as part of the Acorn TV August 2017 premieres calendar. 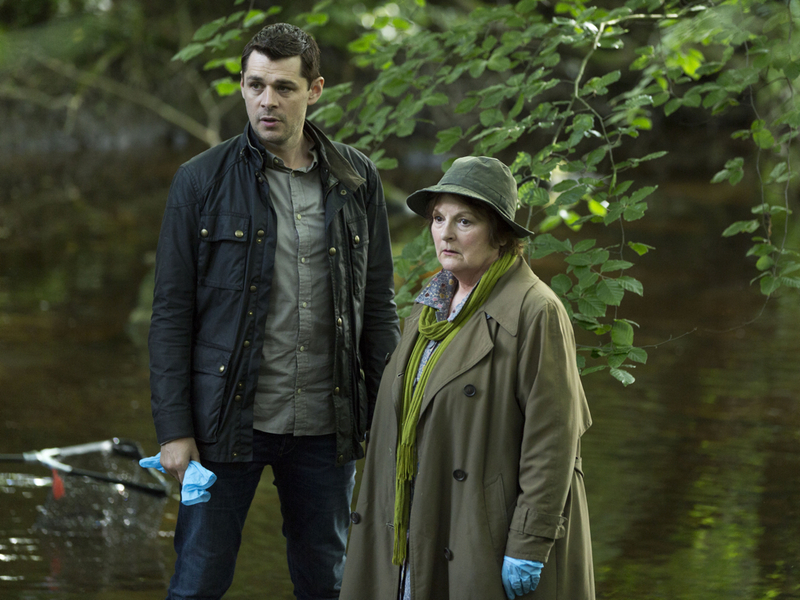 Two-time Oscar nominee Brenda Blethyn stars as the brilliant detective chief inspector who, despite being somewhat cantankerous, often calls suspects and victims alike “pet.” Kenny Doughty returns as her go-to detective sergeant, Aiden Healy, in four new stand-alone films. If you’ve never seen “Vera,” Acorn TV has all seven seasons for streaming. If true crime is more your thing, Acorn TV also offers the exclusive U.S. premiere of “Hunting KGB Killers” in August. This new documentary investigates the 2006 poisoning of former KGB officer Alexander Litvinenko in London. The final exclusive U.S. premiere should be a treat for fans of the Brit detective series “New Tricks,” available on Hulu. The star of that show, Amanda Redman, plays a demanding doctor/administrator at an overwhelmed cottage hospital in southern India. She’s a delight in the series, which follows a young doctor who finds that her new job at Good Karma Hospital is way more than a distraction from her troubles back in London. Take a look below for other premieres coming to Acorn TV in August. This new British documentary tells the inside story of former KGB officer Alexander Litvinenko, who was poisoned with one million times the lethal dose of polonium in London. The subsequent international manhunt led to the Kremlin. The story is told in full for the first time, with exclusive access to key individuals. Award-winning Aussie legal dramedy returns with Cleaver Greene (Richard Roxburgh) on the run after he crashes into the hiding place of his old mentor, now Australia’s most wanted man. As Sydney descends into crime and fear it looks to the return of its most unlikely hero. Junior doctor Ruby Walker (Amrita Acharia) arrives in a coastal town in tropical South India looking for a job and a distraction from her heartbreak. She anticipates sunshine, palm trees and picture-perfect beaches. She’s also prepared for the sacred cows, the tuk-tuks and the Delhi-belly that everyone warned her about. What she doesn’t expect are the realities of work, life and even love at an under-resourced and over-worked cottage hospital. Amanda Redman, Philip Jackson, Neil Morrissey and Phyllis Logan co-star. The Amazing World of Gravity: A unique documentary on the physics of gravity, featuring unexpected historical insights, cutting-edge science and exciting new experiments. The Man Who Shot Tutankhamun: As the official photographer for Howard Carter’s Tutankhamun excavation during the 1920s, Harry Burton created some of the 20th Century’s most famous images and helped to make Tutankhamun an international sensation. Set in a beautiful country house hotel, this 2010 BBC comedy follows the trials and tribulations of staff members in the high-pressured kitchen. Alan Davies stars as head chef Roland White and Darren Boyd plays his sous chef, Bib. Stephen Wight co-stars as ambitious new apprentice chef, Skoose. The series also features the restaurant’s manager and Roland’s secret admirer, Caroline (Katherine Parkinson) and a quirky waitress Kiki (Isy Suttie). The hotel’s owner, Celia (Maggie Steed), completes the motley crew. This drama from “Prime Suspect” creator Lynda LaPlante follows each case from the crime to the police investigation and on to the courtroom in the pursuit of justice. Each season features two feature-length episodes following the same case. Love Acorn TV but have noticed some primier dates don’t come to fruition.. Haven’t seen Vera in “coming soon” so questions arise….Love Vera, hope your site is correct. You would think Acorn would be looking at Britbox behind them. Hi Ann, I just checked again and the schedule they sent me has it down to premiere Aug. 7. I do see what you mean that it isn’t listed under “coming soon” on the site. Not sure why. I love Acorn TV and Vera! I’m interested in the series New Tricks that you mentioned. However, I searched Acorn TV and don’t see it. Is it coming later in the season? Thanks! “New Tricks” is now on Hulu.